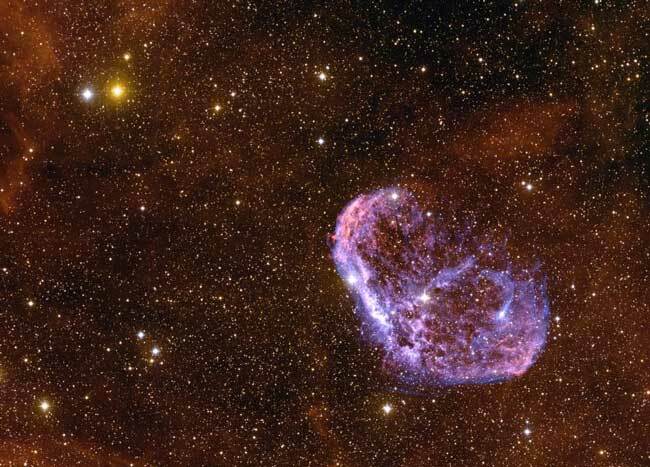 Explanation: What caused the Crescent Nebula? Looking like an emerging space cocoon, the Crescent Nebula, visible on the right, was created by the brightest star in its center. A leading progenitor hypothesis has the Crescent Nebula beginning to form about 250,000 years ago. At that time, the massive central star had evolved to become a Wolf-Rayet star (WR 136), shedding its outer envelope in a strong stellar wind, ejecting the equivalent of our Sun's mass every 10,000 years. This wind impacted surrounding gas left over from a previous phase, compacting it into a series of complex shells, and lighting it up. The Crescent Nebula, also known as NGC 6888, lies about 4,700 light-years away in the constellation of Cygnus. Star WR 136 will probably undergo a supernova explosion sometime in the next million years.